I was interested in a La Crosse color weather station. So I found the La Crosse V22 WRTH station is a very intriguing choice. I thought I would write a quick review. My review will provide information about this weather station that isn’t readily easy to come by. So I will do the research and then you can examine the La Crosse color weather station as I see it. Then you can make your decision whether you are in or out on this selection from La Crosse Scientific Technologies. They are designed and built in right there in La Crosse, Wisconsin. I find this weather station to be a great choice for steady weather data gathering. 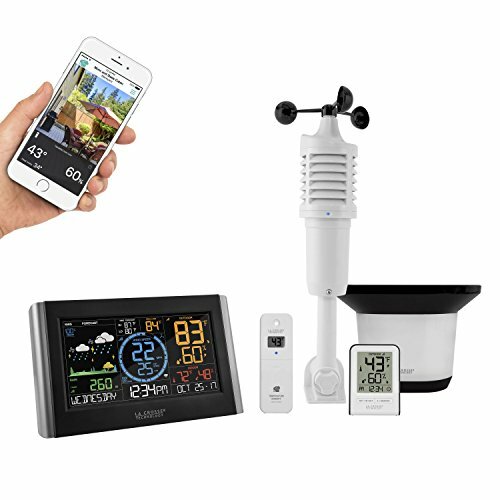 My experience with a La Crosse Scientific Technology weather station is that they provide you with solid scientific readings. The data from your local area is collected by an accurate weather station. This is an advantage to you. So I need to put you on notice that, this review is complete with the exception, that I do not own this unit myself. I do own two La Crosse weather stations and I know the quality that is built into a La Crosse wireless forecast station. I know the company and the people that work there. I have visited the La Crosse headquarters personally. The La Crosse area is full of really nice people. So I initially looked at the benefits of owning the La Crosse V22-WRTH and there are some really cool things that it gives you to enjoy. Here is a short list of features I found that I needed to see for me to look further. Wind speed & rain measurements you can select what history you wish to look at. It has full calendar features-like day of the week, month and dater as well. It has the year and months already programmed in for you. So why do I need these are the following thoughts. Well, the first thing is that I personally just simply prefer a color weather station. I find that the black and white or gray screens are harder to see. I also find the La Crosse color weather stations to just pop out at you. The colors are bright, cheery and easily seen and read. This is very important to me. How do you feel about this? Since I have owned my forecast stations I love the way these weather stations now can give you a forecast for the next 12-24 hours and they use very cool and colorful icons to depict them for you. Here is a picture of some of the icons they will show you in your local area weather forecast. One more word here on a favorite of mine. It is supplied with Wi-Fi access. You are able to access the La Crosse View App which is an easily installed, and easily used app for your mobile device. I use my La Crosse View app many times in the day to easily see my local weather conditions. This adds to my ease of knowing the outside weather for my current and next few hours plans in my day. All fun and very helpful for me. PLEASE remember it is always recommended to use Lithium batteries for all outdoor sensors that you are using. Lithium handles the temperature weather condition changes best for you. They will give you the best and longest lasting power. Here is the list of your required needs for the V22-WRTH model. 5-volt power cord (required) into the V22-WRTH station display. So it’s 3-AA batteries for optional backup of your time and date. Please note that if you only use batteries in your display unit you will not be getting any automatic updating of sensor and Wi-Fi information. In order for constant updating to occur properly, it is a requirement to have your display powered in your home by the power cord. The batteries are used in the display only as a backup power supply in case of a power outage. Since this is inside normal alkaline batteries will be fine for using here. The sensors available on this model are the wind speed, and the temperature and the relative humidity (the Thermo-hygro sensor). The unit also has rain collection and measuring, basically in the form of a self-emptying rain gauge. Make sure you mount it at least 6 feet above the ground, and use the provided bubble level, to make sure it is mounted level. This is for the best possible results. So you have three separate sensors you need to mount and locate. All of the transmissions are wireless. The range is the usual up to 400 feet for good transmission results. These results could vary widely depending on any obstacles or natural boundaries that exist between your sensors and the home-based display unit. A brilliantly colored weather station display. The display has a high low switch for adjusting the brightness of the screen for your viewing preferences. The facing will display the following information for you to view. The settings are being constantly updated throughout the 24 hour period. Here is what you can see on your display. Across the bottom is your calendar info, such as day of the week, month, and date. The current time is featured as well. Next, you can see the weather forecast icons for the next 12-24 hour period of time. It will display the current temperature and relative humidity both outside and inside. The center is where you will see the current wind speed and the top wind speed today. The amount of rain measured today will be list prominently for you as well. La Crosse has recently developed the La Crosse View App for you. It uses Wifi and connects all the pieces of your weather station together cohesively. The App is free to you and can have added storage of history limits added to it by purchasing a monthly subscription for using the View App. ✅ You may use this whole unit of sensors and displays in two ways. Option one is as a free-standing weather station without any Wi-Fi app connections or you may use to its full potential by using both displays in your house, in separate rooms of your choice, and then using all three outside sensors at three different locations as you desire. Then maxing out it’s usage by connecting everything together, by adding all sensors, and both displays to your La Crosse View App. This is a definite benefit from maximum usuage. ❌ The station comes with three separate sensors for the outdoors. So you will need to scout out the best location for mounting. So you need to mount three sensors in three probably different locations. If you aren’t that handy you may find three installations, all though maybe simple to some, to be a bother to you. ❌ The colored display while well lite and colorful, can only be seen legibly at only certain direct angles. This will need your attention in successfully setting up for the best viewing for you. So I find with this weather station that the value is there. The ease of set up is presented to you and with these things in mind I would rate this a must purchase for the up and coming weather expert. It is definitely more exciting and provides more options than the lower price ranged weather stations. This one I rate as a great choice, for what I call the “Mildly More Than a Casual Observer” level of weather interest. I believe this is a great learning tool and a solid stepping stone on your way to using weather instruments to better your daily life. The La Crosse Technology V22-WRTH-INT is a worthwhile choice to look at if you are a mildly more than a casual observer of weather. Well, what do I mean by that. This is my look at a La Crosse weather station with wind speed. The La Crosse V40 Pro Weather station is a complete weather instrument kit. After I opened It, I then walk you through the weather station from my personal view. La Crosse Color Weather Station is my review on the model V22-WRTH. Upon further examination I unearth the best parts of this very nice wireless weather station.